In August of 2013 I joined Daniel Moscatelli and Warren Inman in an on-line blog at Model shipwrights that we rather optimistically called “Channel Adversaries”, the idea being to build a model of one of the British or German MTB’s that might have run into each other in or near to the English Channel during the course of the Second World War. I look back on this blog as a very enjoyable period working with Daniel and Warren. I chose to build the Italeri 1/35th scale Vosper MTB as did Warren. Daniel chose the Italeri German S-100. During the build Darren Baker asked me if I would consider doing a build feature of the Vosper when the smoke had cleared and the build was finished and I agreed. I thoroughly enjoyed building the Italeri S-100 and MAS 4a MTB’s so the RN Vosper was a model I was looking forward to building. On arrival of the Vosper in the shops I was rather horrified to see that Italeri had produced what must be the least inspiring MTB model ever released. I had fond memories of the old 1/72nd scale offering by Airfix with the gorgeous twin Oerlikon bandstand and 4 torpedo tubes. Italerireleased an early version Vosper with no forward gun, two tubes and a rather ugly little dustbin turret with twin Vickers guns in it hiding behind the wheelhouse. To top the package off Italeri chose to portray an MTB in what is probably the dullest paint scheme ever put on a ship. To put things rather bluntly I was disappointed with what should have been the coolest MTB of the entire Italeri 1/35th scale MTB series. When my Vosper arrived I was even more disappointed, the huge package belies what is contained inside. After removing the hull and deck from the box it is rather disconcerting to see a couple of small sprues cowering in the corner. I put the model in my stash and that is where it remained for quite a while giving me some time to think out what to do with it. There was absolutely no way I was going to do an OOB build of the Vosper so I looked around in various reference books and on the Internet to see if I could find a version that would cause the modeling juices to start bubbling. As things sometime happen I found a painting on the internet by Joe Hinds from Richmond Virginia portraying Vosper 234. The 234 was commanded by Lt. Peter Dickens, DSO MBE and DSC and a great grandson of Charles Dickens. Vosper 234 was the embodiment of all I was looking for in a build of a Vosper, feisty, tough looking and armed to the teeth with a 20mm Oerlikon forward, rocket flare launchers fitted to the torpedo tubes and I would hazard a guess that she also carried Lewis machine guns, (photos of 234 show the beefed up construction on the torpedo tubes abeam of the wheelhouse). 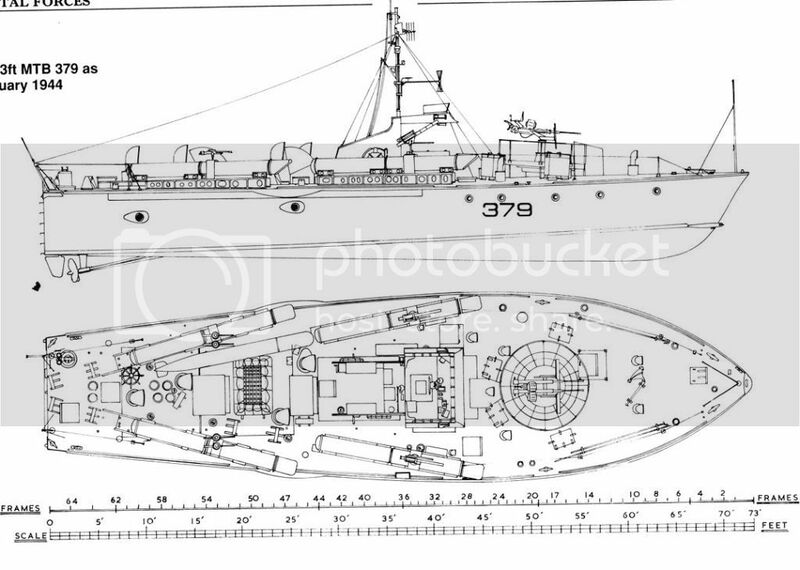 Choosing to build 234 would entail buying Italeri’s PT boat conversion set to get hold of an Oerlikon. I also bought two sets of Lewis machine guns, the old version with the big cooling jackets, maybe not accurate but visually more exciting, and a metal Oerlikon barrel with recoil spring. To top things off I bought Griffon Model’s excellent 1/35th scale Vosper photo etch bonus detail set, containing everything but the galley sink. 234’s color scheme was infinitely more satisfying than the bog-standard grey in most other schemes and would be an interesting weathering challenge. A final addition would be a third rudder that was retrofitted to 234 to improve her manoeuvrability. The fit of the parts in the ItaleriVosper is excellent and the general quality of the parts is good. The mushroom vents show some rather nasty sinkholes and there is some flash in evidence but I encountered few real problems during the build except for the wheelhouse which needs some taping, clamping and puttying to get it looking like a solid construction. The Griffon Model PE set is extensive which leads to a lot of time consuming work removing plastic parts and replacing them with PE detailing. This reaches manic heights with the deck supports for the depth charges and mines, wheelhouse and bridge and the Vickers dustbin turret. The metal “skin” for the dustbin is an exceptionally bad idea I wish I had left well alone. The PE does add gorgeous detail in other regions though and the voice tubes and telephones bring things to life in way that the OOB model can’t. Some of the PE sub-constructions consist of huge numbers of metal parts and it is a hit and miss process of choosing which adhesive to use for maximum strength of the assemblies, Gator Grip or super glue. The 20mm Oerlikon looks magnificent and should have been included with the model instead of being made available in a conversion set. I scratch built a ready to use ammunition container near the Oerlikon cannibalizing some hinges and butterfly nuts from the Griffon set. I used tissue paper painted on with well thinned white glue to make the canvas tube covers, an experiment which worked out very well and which I will definitely use again. The paint job was a very enjoyable challenge and a point of much discussion with Warren on what was acceptable as the grime and dirt of use during long periods of operations and bad weather and when it became a case of a lazy crew needing a big toe up the stern to get them doing some maintenance again. I experimented with AK‘s slimy green weathering liquid to try and give the impression of the weed and algae build up around the water line. I’ll let you be the judge on how well the final appearance of 234 turned out. All in all an enjoyable build but I must point out again that that is due to the large amount of aftermarket sets that easily doubled the price of the original model. 234 turned out quite nicely, and most of the photo etched items supplied by Griffon model have been incorporated in the build. I don’t think I would bother with the huge amount of interior work in the wheelhouse again because it is impossible to see any of the detailing once the wheel house is fitted. I would also skip the metal skin that is supposed to fit around the Vickers dustbin. It does make the maintenance hatch possible giving a good view of the ammunition- and spent shell case bins inside the turret but the two parts are fiendishly difficult to fit and to glue. An enjoyable 5 month build that was worth the time, money and effort as far as I am concerned. A trouble free model that does require a little bit of extra detailing to its subject justice though. To echo the sentiments above Julian, what a great build! It's been fantastic to follow your adventure along with Warren and Daniel in completing three superb models! You've given life to these great models. This is really very sad news. RIP...Julian Condolences to family and friends...he was such a great guy.